A USB-powered desktop humidifier could be a great investment for people who suffer with dry eye syndrome. 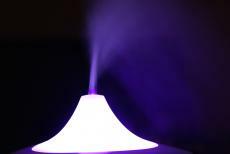 That's according to a new randomized study out of New Zealand that analyzed the effects of a desktop humidifier on computer users. 44 people participated in this study over a two-day period. On each daily session, study authors asked participants to use a computer for one hour straight. During the first trial, doctors placed the humidifier close to the study participant and turned it on. Researchers turned the desktop humidifier off during the second day's trial. After both trials, researchers took tests of study participants' eyes. Although there were no major changes in the patients' lipid layers, doctors noted stronger non-invasive tear film break-ups with the device on. Anecdotally, most patients said their eyes felt better with the humidifier on. When researchers measured the air quality in the study rooms they found that humidity increased by five percent when the humidifier was on. All of the rooms participants used were temperature controlled and air-conditioned. This is the first major scientific study to confirm desktop humidifiers have a beneficial impact on dry eyes. Researchers concluded that these humidifiers could be effective for strengthening tear-film stability, especially for people who stare at computers every day. Desktop humidifiers are readily available online and at most major retailers. Dry eye syndrome affects millions of patients, which makes it one of the most common eye disorders around the world. People with dry eyes often suffer symptoms like temporary hazy vision, increased tear production, and eye pain. The most obvious reasons for the increase in dry eye syndrome cases include a lack of sunlight exposure, nutrient-deficient diets, and prolonged use of electronic devices. Some people without dry eyes develop dry eye-like symptoms by staring at computer screens for too long. This disorder is referred to as computer vision strain. Besides investing in a humidifier, one easy way to protect the eyes while using a computer is by practicing the 20-20-20 rule. Every 20 minutes, look 20 feet away from the computer screen for 20 seconds. Doctors say that following this rule can significantly help the eyes increase tear production. Another simple strategy for combating dry eye syndrome is by supplementing with vitamin D3, vitamin A, and omega-3 fatty acids. Dry eye patients wearing contacts should consider wearing daily disposable lenses or ordering contact lenses specifically designed for dry eye syndrome. The lead researchers in this study include Drs. Michael Wang, Yvonne Lu, and Jennifer P. Craig. All professors involved in this project work at the University of Auckland's Department of Ophthalmology. For more information on this study, be sure to pick up the latest edition of Optometry and Vision Science. Study authors entitled this research paper, "Randomized Trial of Desktop Humidifier for Dry Eye Relief in Computer Users."